Goth tinged, NWOBHM inspired hard rock is... quite the appellation but one that Idle Hands wear nobly and with impressive skill. Their latest offering, Mana is a masterful release, one that fascinates the listener and seems to continually drive them to new heights. The band who exploded onto the scene in 2018 with their debut and seemingly endless tour dates, they needed a stunning follow up. Mana is their thrilling debut full length that fully encapsulates just how good the band is and what they have come to mean for so many people. It's exciting to see a band really take the bull by the horns on their debut. Mana is a potent piece of work, a record that fascinates the listener and seems to constantly push them further. The melodic content is excellent, the songwriting thoughtful and the execution self aware. Significantly better put together than its predecessor and with execution that is to die for, Mana is mesmerizing and exciting. You will find yourself getting lost in swooping sonic vistas. Vistas that speak to the overpowering sense of fun and beauty that this music can have. It makes for deeply engaging listening, it's almost impossible to turn Mana off. Mana is the sort of record that you are going to find yourself picking apart in spin after spin. It's diverse set of influences makes it unique and different. After all - how many bands these days really understand goth in the fundamental way that impacts their music for real? Yeah - not a lot. Mana is the sort of deep set stuff that is going to keep you coming back for more. 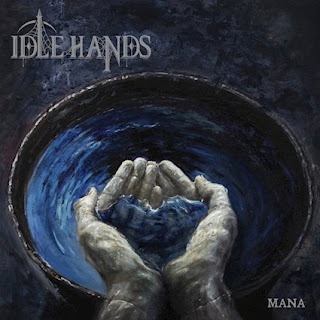 So far from one hit wonder, I see Idle Hands rapidly making their way forward as industry darlings who fuse genres and drive us all to sonic absolution.